On October 24, 2013, family members, guests, and Department of Youth Services (DYS) students, administrators, faculty, and staff filled the chapel on the DYS Mt. Meigs Campus to celebrate the release of the sixteenth installment of Open the Door, an anthology series edited by teaching writer Marlin “Bart” Barton and written by his students in the Writing Our Stories (WOS) program. “I’d like to thank the parents who brought some of our gold card members here today,” said DYS Executive Director Walter Wood, referring to the parents who brought their sons back to campus to participate in the reading. In total, fourteen students read their work—or the work of others—during the book release ceremony. A Montgomery native, McCall attended Sidney Lanier High School where he competed in both basketball and football. The latter earned him All-State honors. During McCall's senior year at Lanier High School, he became the second African-American recipient of the prestigious Jimmy Hitchcock Memorial Award, which recognizes Christian leadership in athletics. Upon graduation from high school he attended Auburn University as a scholarship athlete in football. McCall graduated in 1991 with a Bachelor of Science degree in marketing. After graduation McCall worked in the banking industry as a loan officer and branch manager before being hired as the Director of Minority Business Outreach for the Montgomery Area Chamber of Commerce. After spending three years on the Chamber's management team, McCall joined the Montgomery Academy, becoming the first African-American to serve at the Montgomery independent school as an administrator and head coach. 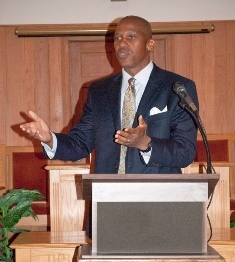 He currently serves as the school’s Athletic Director and head football and basketball coach. “I grew up in Ridgecrest,” said McCall, receiving nods from some of the knowing student writers. “It’s a tough neighborhood now, and it was a pretty tough neighborhood then. But, guys, today is about you not me. Today, I’d like to share some things I wish someone had told me at your age. These are the three Cs of a champion: 1) Character; 2) Courage; 3) Commitment. “‘Character’ is who you are when no one’s watching. Make sure your character reflects not just in your writing, but in everything you do. of this version of hell. and guards everywhere you go. when you’re trying to eat dinner. because there are no more nightmares. all the people you’ve hurt in your life. into the grass and devours it like acid. The branches are abnormally shaped. like blades raised for battle. the leaves shake side by side in fear. as dark and hollow as wide fearful eyes. creating color in the body. adding many pages of taste. that orbit within the cooked circumference.